Disney Vacation Club Owners! 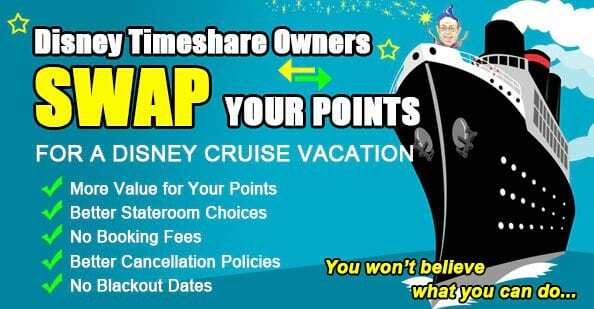 Swap Your Points for a Disney Cruise Vacation. You might be asking yourself "How does this all work? How do I ‘swap’ my points?" Our Cruise Swap process is extremely easy. One of our Cruise Specialists will work with you, one on one, to find the Cruise you and your party would like to sail on. We then take the total cost of your Cruise and calculate how many points would be required to rent out to cover the cost. You can also add cash to the reservation if you are short the required amount of points. This information is then provided to you in a quote format. If you are satisfied with the quote then David’s Vacation Club Rentals will immediately book your Cruise and proceed to rent your points. The funds received through rentals will be applied directly to the cost of your Cruise. Examples of points needed to cover cost of cruise. ALL YOU WOULD NEED IS 151 POINTS TO BE RENTED OUT AT $13.50 PER POINT TO COVER THE COST OF YOUR CRUISE. HOW AMAZING IS THAT! RENT JUST 421 POINTS AND YOU ARE SETTING SAIL FOR AN ADVENTURE OF A LIFE TIME! The cruise is subject to normal Disney Cruise Line changes and cancellations, so if you need to make changes or stateroom type, etc., we work to make that happen. Should you need to cancel for some unforeseen reason, you are entitled to any refund DCL provides us for cancellation, not including on board credits. DCL sees this as a cash reservation made by our travel department. Here are some examples of the point savings you can realize. For more information, contact our special cruise team at 800-610-5791 and ask for a points cruise specialist.